Nanotechnology is at the forefront of advances in medicine. Nanomedicine: Technologies and applications provides an important review of this exciting technology and its growing range of applications. After an introduction to nanomedicine, part one discusses key materials and their properties, including nanocrystalline metals and alloys, nanoporous gold and hydroxyapatite coatings. Part two goes on to review nanomedicine for therapeutics and imaging, before nanomedicine for soft tissue engineering is discussed in part three, including organ regeneration, skin grafts, nanotubes and self-assembled nanomaterials. Finally, nanomedicine for bone and cartilage tissue engineering is the focus of part four, with electrically active biocomposites as smart scaffolds investigated, as is cartilage and bone tissue engineering, regeneration and replacement. 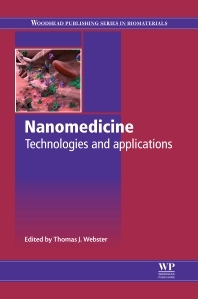 With its distinguished editor and international team of expert contributors, Nanomedicine: Technologies and applications is an indispensable guide for all those involved in the research, development and application of this exciting technology, whilst providing a comprehensive introduction for students and academics interested in this field. Dr Thomas J. Webster is an associate professor for the Division of Engineering and Department of Orthopaedics at Brown University, USA. He directs the Nanomedicine laboratory which designs, synthesizes, and evaluates nanomaterials for various implant applications and is noted for his work in this area.